Add security to your model year 2014+ Glove Boxes! GL-2: Add security to your Mt. Rushmore model year 2014 or later Ultra Classic Electra Glide's upper fairing lower glove boxes by incorporating chrome barrel locks. The GL-2 Kit comes complete with two dual slot show chrome over brass premium barrel lock assemblies with cams, mounting hardware, special drill bit and installation instructions. 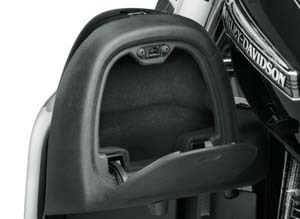 The barrel locks are dual slot allowing the rider to leave the door or doors unlocked with the same "no key needed" access as the stock doors or allowing the rider to lock one or both doors for added security. Easy installation. 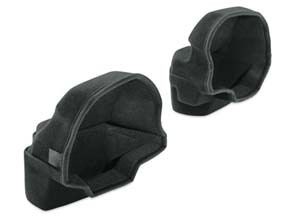 Also compatible with our GP-4 Storage Pockets with minor modifiation to the GP-4. GL-2B: Same as above but with black barrel locks. 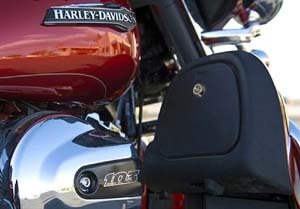 GKY-L2: The GL-2 can also be keyed to match your existing Ultra Classic Electra Glide's ignition key using this service. All you have to do is mail in one of your spare ignition key (please use padded envelope or CD mailer and mail to eGlideGoodies ATTN: MATCH KEY) along with your name and we'll match the key to your order and coordinate keying the locks appropriately. 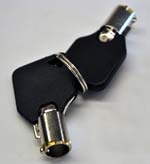 You will get your spare ignition key (along with two keys from the kit) back with your order. Consider adding the GKY-KPC Premium Key Cover for each key. We do not have access to H-D key codes for the GL-2 producct, so supplying the key code will not work. 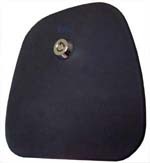 GKY-PHD: Genuine OEM Harley-Davidson plastic key cover in black. GKY-PSH: Side hole key cover in black.